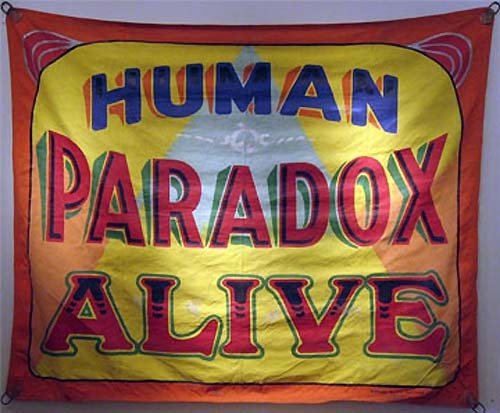 Sideshow banner by Fred G. Johnson. Summer has arrived with a vengeance here in the Gentrified Kingdom and it’s a cruel mistress indeed. You never quite get used to a New Orleans summer but the first month is the hardest; eventually you adapt or become completely languid. That’s Oscar and Della’s response: they are liquid kitties right now and spend as much time on the relatively cool wood floors as possible. Hmm, Liquid Kitties sounds like a band name. @Monkeyfister1 You are correct, sir, and for 2 days in a row. I thought it was coming down on the last day of the term. @Monkeyfister1 Careful not to drown. On to this week’s theme song. I recall the first time I heard Reelin’ In The Years and being blown away by Skunk Baxter’s lead guitar. Trivia time: Jeff Skunk Baxter is now a defense consultant and a zealous right winger. It’s a far cry from his time as a long haired guitarslinger for Steely Dan and the Doobie Brothers. Speaking of creeps, the first of two live versions is introduced by Bill Cosby. This clip makes it crystal clear that Steely Dan’s success had nothing to do with their looks. The second rendition is a radically re-worked arrangement from their return to the stage in the 1990’s. More stowin’ away the time after the break. I’ll try not to drop any more gs than necessary. The Audience: We begin with a deviation from the usual Saturday morning post format but what’s a little deviancy among friends. Sorry if that sounded like some Duggary was about to break out here at First Draft. I think you know what I meant. Thursday night, Dr. A and I went to see the National Theatre’s production of Peter Morgan’s The Audience with Helen Mirren. I wish we could have beamed to Broadway or the West End to see it but it *was* on the big screen in Harahan, LA. Scotty needs to work on that. That’s right, it was a filmed play but it starred the original London cast. It also featured bits filmed for the occasion including an interview with Helen Mirren and her wigs. The Audience is about Queen Elizabeth’s weekly meetings with the Prime Minister of the day. They manage to depict Elizabeth at various ages with wigs, clothing, and the tone of La Mirren’s voice. It’s theatrical magic at its finest, which is one reason it’s hard to imagine this working as a movie. Plus, only the Divine Helen could possibly pull this off. Even at age 69, she’s one of the most beautiful women in the world. The play reflects Peter Morgan’s educated guess at what went on behind closed doors. I wonder if he’s aware of Charlie Rich’s dictum: No one knows what goes on behind closed doors. My favorite scenes involved two of the most human PM’s of Elizabeth’s reign-John Major and Harold Wilson-and the most monstrous, Margaret Thatcher. I really enjoyed it as did Dr. A although I’m not sure if she liked my lecture on the Wilson years as much as I enjoyed delivering it. I was in Anglophile, British politics buff heaven y’all. The Lib Dems’ Cleggtastrophe: The junior partner in the late, unlamented coalition government, took a shellacking in the May 2015 election. The Liberal Democrats went from 23% of the vote and 57 seats in 2010 to 7.9% and 8 seats. The meltdown was predictable but not preventable: it’s what happens when you turn your back on your political base. Guardian political editors Patrick Wintour and Nicholas Watt have the gory details. The Myth Of The Lost Cause: I’ve written frequently about how the South lost the Civil War but won the narrative about what they laughingly call the War Against The States. There’s a fine piece at the TPM Cafe by Tony Horwitz that nails how it happened. The why remains somewhat mysterious to me but the answer lies at the corner of Racism and Reconciliation. Political Baseball: That play on the term “political football” doesn’t quite work but strained analogies and awkward metaphors are nothing new for me. That brings me to our next nugget of internet gold courtesy of Grantland’s Bryan Curtis: Like Deja Vu All Over Again: The History of Baseball Metaphors in American Politics from Abraham Lincoln to Harry Reid. That’s a mouthful, y’all. I think it would have really pissed off the late, great New York Giants manager, John McGraw. Muggsy would have made Curtis run laps and had Jim Thorpe dangle him out a hotel window. In many ways, Thorpe was the Keith Moon or Joe Walsh of pre-Great War MLB. Now that I’m finished with that tangent, it’s time to get to the point. It’s a helluva article, you should read it and skip the laps. It’s too damn hot. Oddball Recommendation: Posting the Olbermann video conjured up images of a segment on his old MSNBC show, Oddball hence the sub-header. I was perusing Longreads.com and came upon an article by novelist, gay activist, and former New York catering waiter, Alexander Chee. This post is so long that I bet you’re ready to escape. That brings me to our next selection. The Great Dannemora Jail Break: All I know about prison and escapes therefrom I learned at the movies. It’s a genre I’m quite fond of: White Heat, Escape From Alcatraz, and The Shawshank Redemption are among my favorite films. It is definitely something I prefer to experience vicariously, which is one reason that I’ve been avidly following the escape from the Clinton Correctional Facility in Upstate New York. In law school I was involved in the POPS program to fulfill my community service requirement. What we did was to interview elderly and infirm inmates to see if they were candidates for early release. I made two trips to Angola Prison to conduct the interviews. Unfortunately, the two inmates I met with were convicted kiddie rapers and only one of them expressed any remorse. As of this writing, there are conflicting reports about the whereabouts of convicted murderers Richard Matt and David Sweat . One report has them in Pennsylvania, another in Canada. I have my doubts that the two men are still together. Why would guys who methodically planned their escape do something that seems so stupid? Of course, they are were incarcerated so how smart could they be? That brings me to a swell article in Slate by Justin Peters about what might have happened between Joyce Mitchell and the escaped inmates. Apparently, this sort of thing is not as uncommon as one might think. UPDATE: The inmates have been spotted by authorities and Richard Matt has been shot and killed. Saturday Standards: That closing piece was quite heavy, so it’s time to let you escape your troubles with some music. It’s no secret that the late Oscar Peterson is one of my musical heroes. IMHO, Oscar was the greatest pianist of all-time regardless of genre. What most of you probably don’t know is that Oscar had a fine singing voice. The rub was that he sounded exactly like Nat King Cole, so Oscar reserved his singing for the shower. After Nat’s death, Oscar cut an album in 1965 to honor his fellow great pianist. “Reelin’ in the Years” is a fine song, and I have a couple of friends who do a wicked send-up of it, with one of them playing the guitar solo on a penny-whistle. Think Smothers Brothers meets Spike Jones. The last verse reminds us that while we have come “thus far on the way,” there’s still a ways to go. Get your rest, enjoy the victories, mourn those who didn’t get to see it, and then be ready Monday morning to get at it again. We’re not done. Nope. Good reading. Keep on chooglin’. And who knew this weekend could get SO much BETTER!!!??? Cheers buddy! Elliott Randall played the solo on the original version. @Gratuitous: No yuks in that soaring song. @Paper: Maybe so but he doesn’t have a silly nickname.